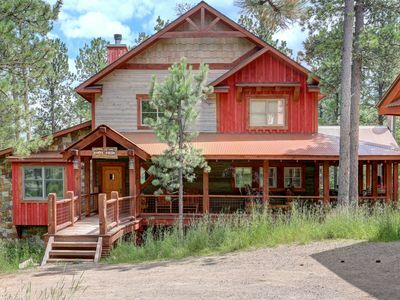 Entire Country Log Home, 2400 sqft, attached 3 car garage, 600' off Nemo Road situated in a mountain meadow & Aspen / Evergreen Forest. Ample parking for all vehicles / trailers. 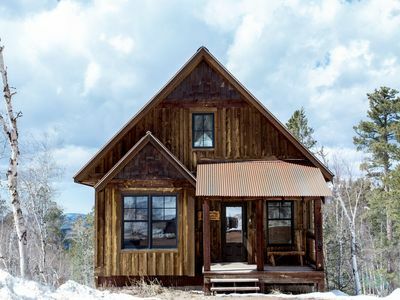 28 quiet serene acres to roam, enjoy and explore. 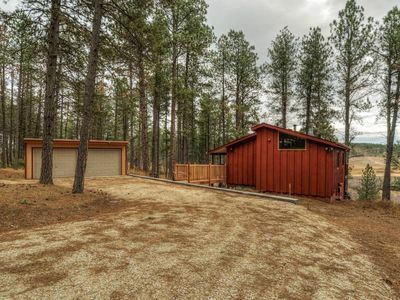 Access to off road riding and trails within minutes of property. 12 miles to Deadwood, 20 miles to Sturgis, 30 miles to Rapid City, all on Fantastic street riding / touring roadways. 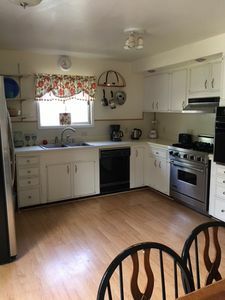 First Floor has a 30x30 Great Room that has Full Kitchen and Island as well as Living Room with two reclining love seats and a reclining couch. 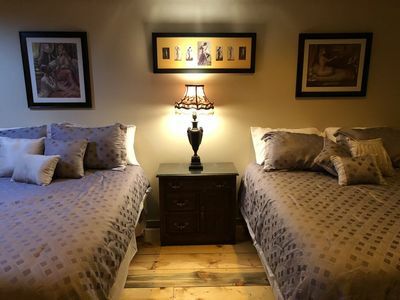 Two Bedrooms and Full Bath with Jacuzzi Tub. Laundry room with washer, dryer and deep sink. 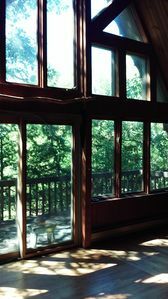 Second Floor has a loft overlooking Great Room, One Bedroom and a Full Bath. 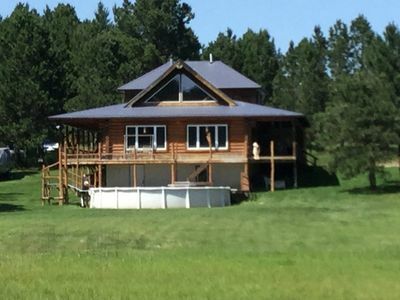 After the hustle, bustle and noise of Sturgis, come home to peace & quiet and enjoy the Black Hills from our 10x30 Front Sun Deck, or if it’s raining or too hot, we also have two 10x60 covered Side Porches. Fenced, undercover area for pets or bikes. 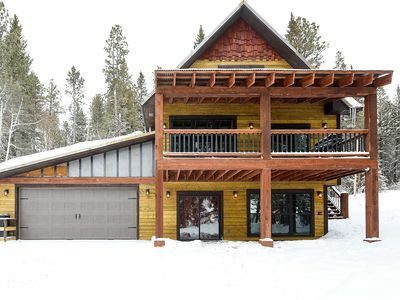 Three car garage to keep your vehicles out of the weather. WiFi is available but fastest speed in this area is 1.5mbps, which is unusable for any streaming. Works fine for email and internet surfing. 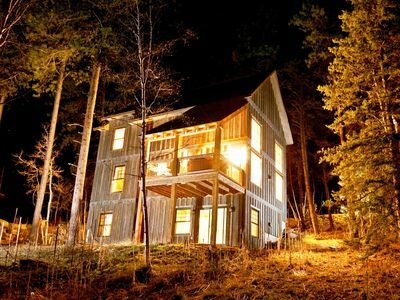 Also provides Cell Phone service in house. Dish Network 200 channels is available in Great Room. Note: Pool on property is under renovation and will not be available this year. Some remodeling work is in progress but will not affect any functionality of home. Stairway floor covering and loft is in process of replacement. 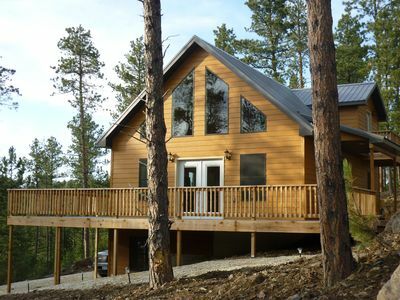 Newly Built 5 Bedroom Cabin. 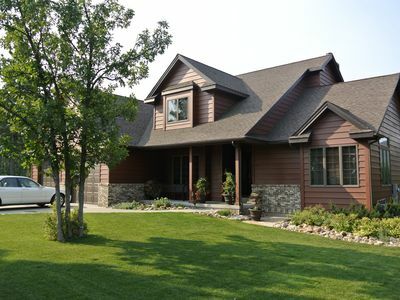 Family-Friendly Setting With Outdoor Pool! 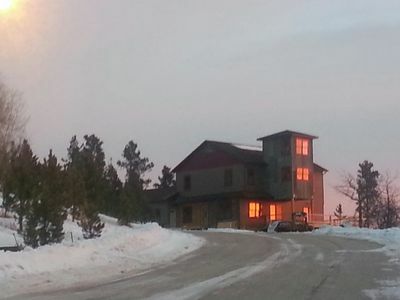 Big Pine Lodge - Beautiful Mountain Views, Private Hot Tub Close To The Slopes! 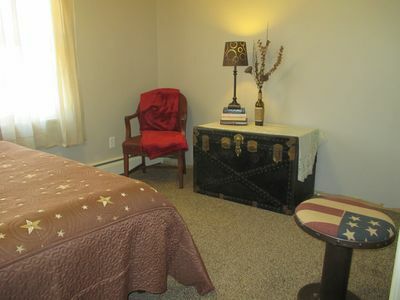 Family Friendly with Community Center Featuring Heated Pool and hot tubs! 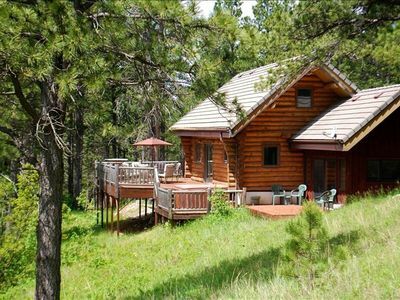 New 3BR/3Bath Cabin Near Deadwood-Hot Tub, Arcade Game, Internet, Pool Access! 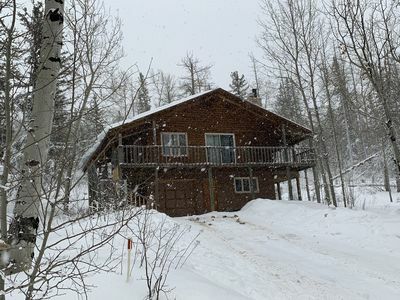 Ideal Location- close to Deadwood & Great Skiing! Amazing Mountain Views! New! 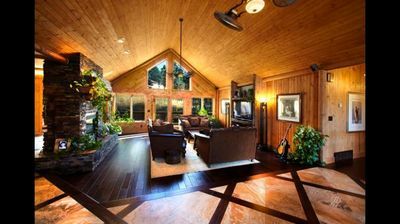 The ULTIMATE home away from home! 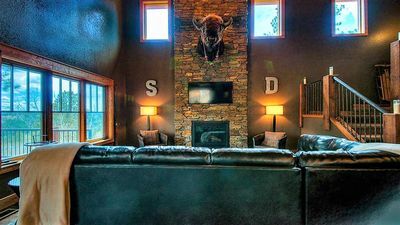 Hot tub, foosball, close to ATV/Ski Area! 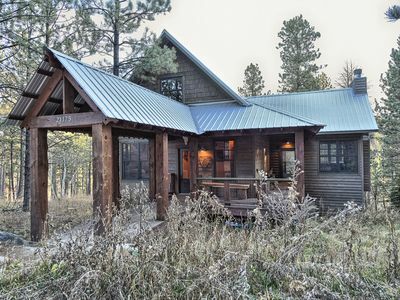 Sawtooth Lodge - Beautiful New 4 Bedroom, 3 Bath Cabin With Shared Pool! 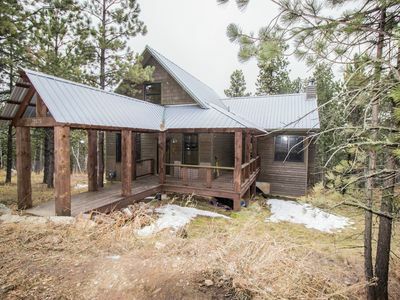 Newly Remodeled, Cozy Cabin on beautiful Terry Peak! 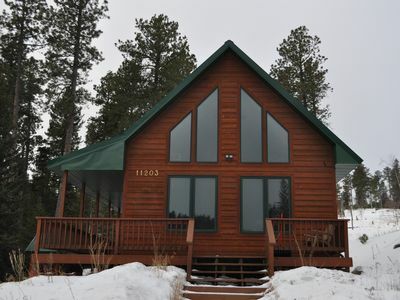 Perfect 4BR Cabin with Tranquil Hot Tub and Clubhouse Access to Heated Pool! 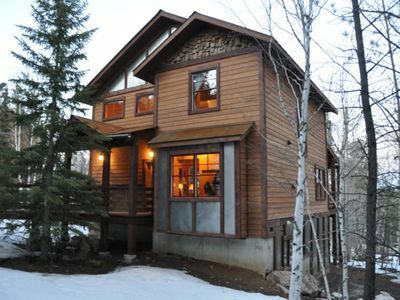 Hillside Hideaway - 3 bedroom in a private, scenic location!